The radar graph has two useful properties, the distance to the center of the radar and the size of each data dot (see below example live). 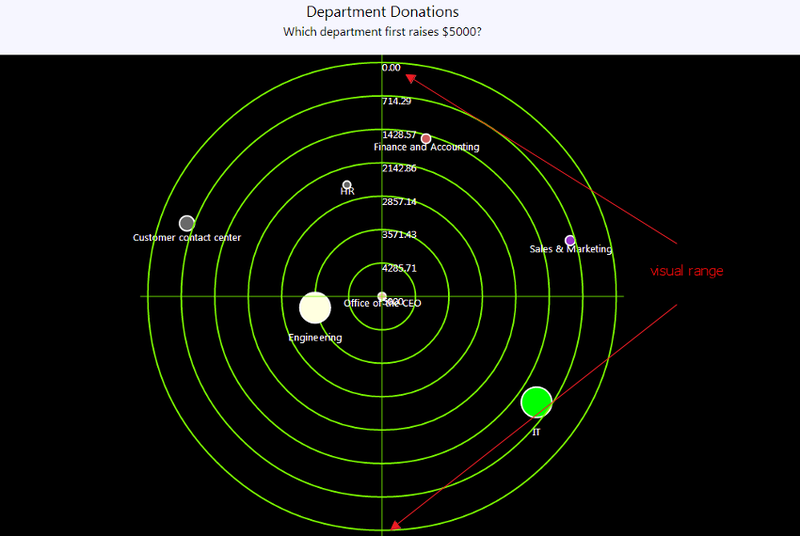 The below examples shows an fund raising competition, to see which department first raises $5000, the distance to the center is the fund raised so far, the size of the data dot represent the size of the department. Note each data dot is color coded. In this mode, each SharePoint list item/document is a dot on the graph. The size of the bubble (optional) can represent a numeric value of the item, and the distance to the center can represent another numeric property. In this mode, data is first grouped. Each unique value in the grouped column is a data dot on the graph. The size of the bubble (optional) and the distance to the center can represent the Minimum/Maximum/Average/Median/Sum/First/Last/Row Count/Unique value of the grouped column.